Staff of IRRI's Crop and Environmental Sciences Division (CESD) staff held a 'stepping-up' party on 28 August for Bas Bouman, CESD head, who moved onto his new role as Global Rice Science Partnership director on 1 September. Robert Zeigler, IRRI director general, gave his message for Bas, followed by videotaped ones from Bas' former IRRI colleagues Shaobing Peng, T.P. Tuong, Darshan Brar, Ren Wang, and Ken Cassman. Bing Bayot, Bas' former staff from the Challenge Program on Water and Food, David Johnson, CURE coordinator, and Bas' wife Stella also shared stories of their fondest memories with Bas. Bas thanked his staff and colleagues, saying it "is not really goodbye" as he will be staying at IRRI in his new role and interacting with many of the same people. T.P. 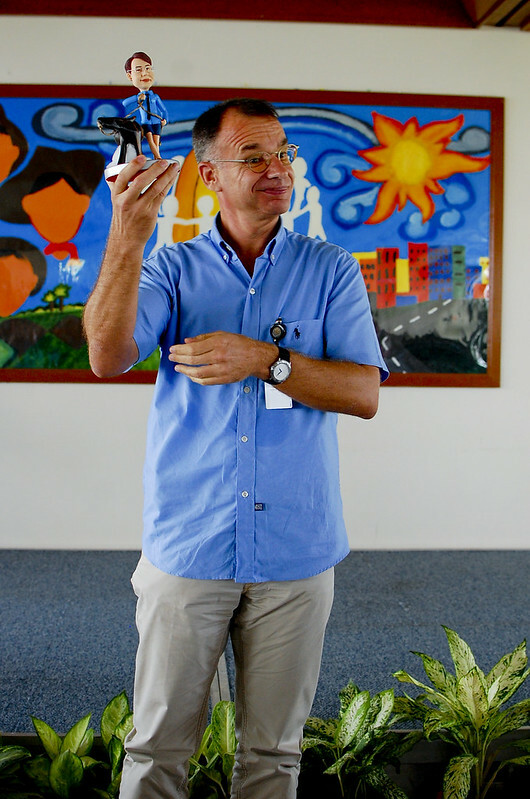 Tuong will return as interim head of CESD until end of 2012, while Achim Dobermann, IRRI deputy director general for research, will look after Program 3 matters. The CESD Management Committee organized the activity.